While on the Educational App Talk forum within their Facebook group, I spoke with many developers. It happened to be math related on the day that I got into conversation with app developer Marcel Widarto, creator of Sight Words & Spelling With Pixopop as well as Sight Words Hangman. The conversation with all of the developers was animated that evening as we were all hungry for cookies while discussing the Chocolate Chip Cookie Factory: Place Value application. After a fun discussion, I was reading through my e-mails and realized that Marcel had contacted me a month or so prior about reviewing his Sight Words & Spelling With Pixopop application, and I have missed the e-mail! 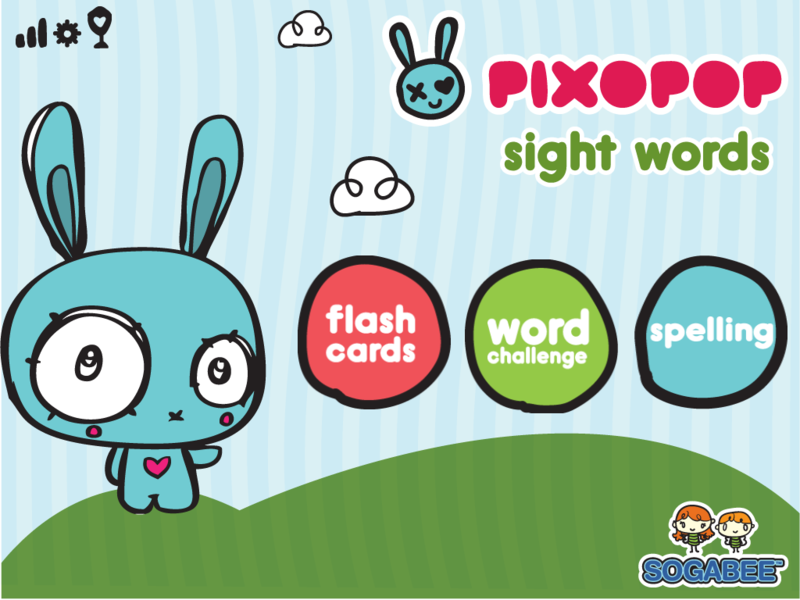 Luckily, he was still interested, so here is the review of Sight Words & Spelling With Pixopop! 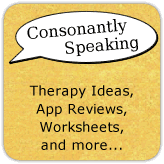 Make sure to continue reading to learn about how to use this application in speech-language therapy as well as enter a giveaway for a copy of this application! 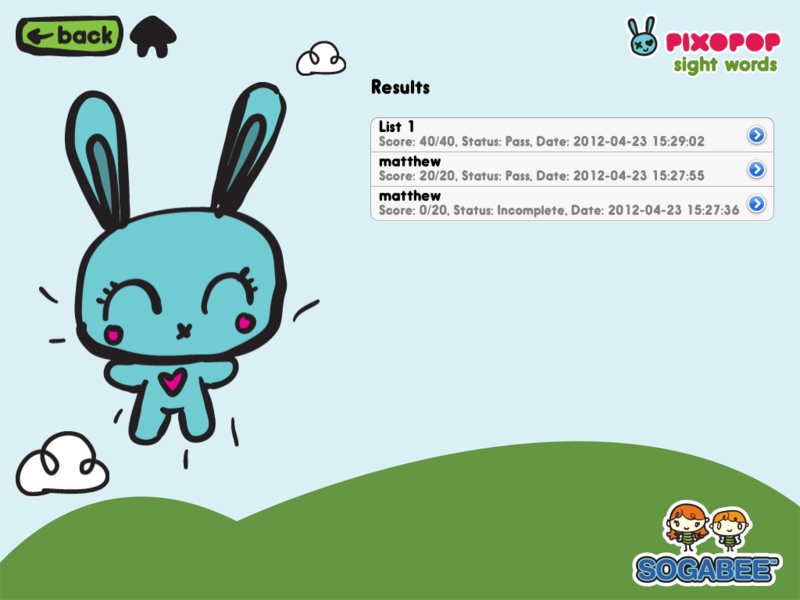 There are three choices of application play on the main page of this application as well as the ability to view scores for students, settings, and trophies students have won as rewards. Word Lists - You can view the various word lists to determine which list you would like a student to begin using. You can also create your own word list if you have words specific to the curriculum that you would like students to work on spelling. Press the "Create New List" button to create your own spelling or vocabulary list for students to work on. Press within the white bar to write a list name using the keyboard, then press the "Save" button. Once you press "Save", it will show the text in green stating that the list has been added. Then, a new bar will appear to type a word into. Type the first word you would like on the spelling/vocabulary list using the keyboard and once you are done, press "Save". The application recommends that when you record a word to include a sample sentence using the word within it. Press the yellow button with a red circle in the middle to record the word. Press the button again to stop the recording. If the word is already pre-recorded within the application, it will not need to be recorded by you. The word will then move to the right hand side of the application and you can add a new word by pressing the empty "Enter Word" bar and following the above steps again. If you wish to remove or edit a word from the word list, select it on the right hand side and four buttons will appear to either re-record the audio, play the audio, delete the word, or be done editing. Once you have completed your word list, you can choose to begin playing the list in flash cards, word challenge, or spelling application play, or press the "Back" button and it will save to the "View Custom Lists" page. You can view the results of a students' progress by pressing the first button in the left hand top corner of application that looks like three bars. It will then show the completed word lists, scores, whether or not the student passed, and the date/time in which the application was used. You can select the individual quiz by pressing the arrow key associated with it. Then, you will see a more detailed view of each individual word and whether or not the student chose the correct answer or not. Also, it will show the score associated with the amount of trials. Clearing a word challenge list without getting any answers wrong will unlock a black and white trophy. Clearing a spelling list without any errors will unlock a color trophy. You can click on the image to view which list the trophy is associated with. There are three options for application play - Flash Cards, Word Challenge, and Spelling. Choose one of the characters at the bottom of the screen (Draco, Stitch, or Pinku). Then, choose the list to be practiced by pressing on the associated number cloud. If you would like the student to work on a custom list, press the "Select Custom List" button instead. 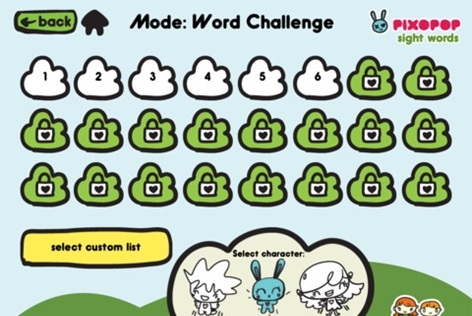 The character will appear next to a cloud with the word inside. 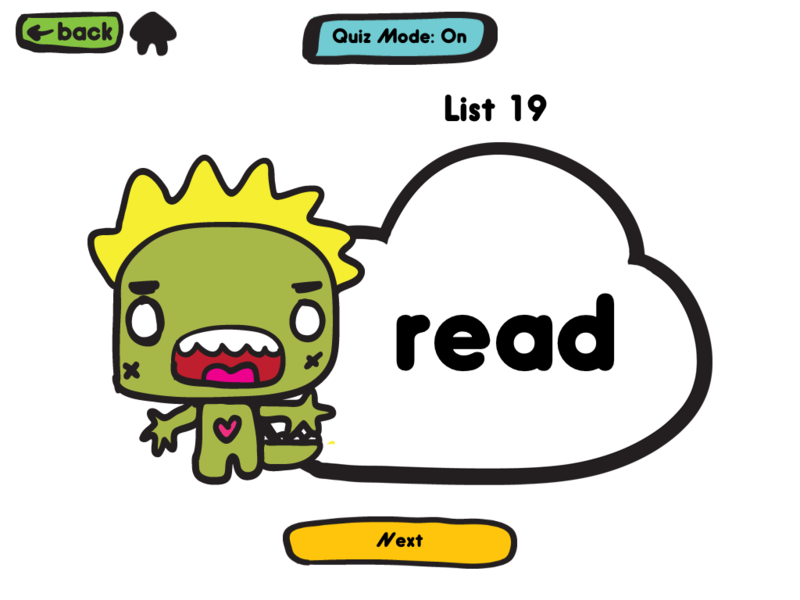 You have the option to turn "Quiz Mode" on or off by pressing the button at the top of the screen. When "Quiz Mode" is on, a student may say the word aloud and then see if he or she is correct by tapping the cloud to hear the word. If "Quiz Mode" is off, words will be stated aloud each time the "Next" button is pressed. Press the "Next" button to go to the next word in the list. Once all of the words have been shown, you can go back to the lists, replay the same flash cards, or go to the next list. Choose one of the characters at the bottom of the screen and then choose a list to be practiced by pressing the number cloud or selecting a custom list. The narrator will state, "press the button that shows the word" followed by the word to be pressed. The student must look at all four choices and determine which word is the one that was stated aloud. If the student answers incorrectly, a sound will play and the incorrect answer will be faded. In addition, one of the three flowers at the top will have an "x" through it. The student is allowed to have up to three wrong answers before he or she has to try the list again. If the answer is chosen correctly, a verbal reinforcement as well as a piece of the character will play/be shown. The score will advance at the top as well. If the student needs to hear the word to be pressed again, he or she can press the yellow arrow button. 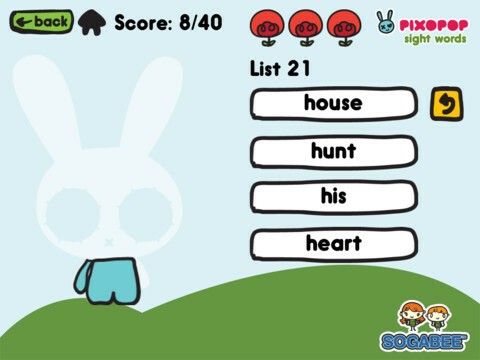 More and more of the character will show as reinforcement for correct answers. Once the entire list has been completed, the student can move on to the next list, see his or her data, go back to choose another list, or replay the same list. Once again, choose one of the characters at the bottom of the screen and then choose a numbered list or custom list. The narrator will then state, "press the letters to spell the word" followed by the word to be spelled. The keyboard will be shown at the bottom of the screen either as an alphabetical or qwerty keyboard (which you can choose in the settings). The student must then type the word and press "Submit" if he or she thinks that it is spelled correctly. If the student did not hear the word the first time, he or she can press the yellow arrow button to hear it again. If the student correctly spells the word, a positive verbal reinforcer will play and an "x" will appear over one of the flowers with three incorrect answers meaning the student must play the list again. If the student incorrectly spells the word, a sound will play and the narrator will move on to the next word. Each time an answer is correct, the score will rise. Once the entire list has been completed, the student can move on to the next list, see his or her data, go back to another list, or replay the same list. I love the fact that the application stores detailed data for how a student does on the application. The rewards, especially in the "Word Challenge" are motivating for students. Flashcards on this application are much more motivating than actual flash cards and can be used by an individual student on his or her own to practice sight words. 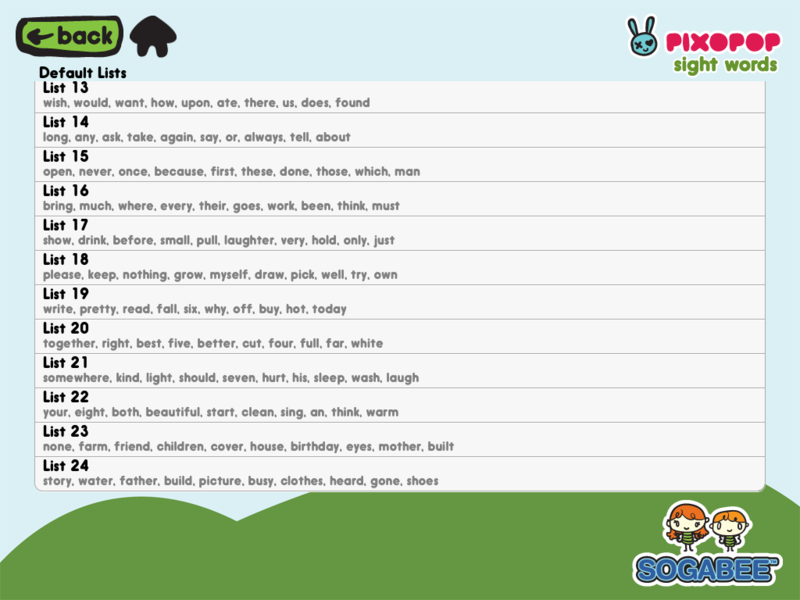 Creating custom word lists for spelling words and/or vocabulary is easy to do! Recording the words is even better for students who have difficulty reading or sounding out words to help them learn the words. The feedback on this application is great because each time a student gets an answer correct, the verbal reinforcement is different (not always "good job" over and over). The artwork of this application is absolutely adorable and is not too bright or dark so that students with vision difficulties or sensory impairments will not have a problem with it. I say this about any application that records data, but I love individual profiles so that I know who played the application when and can store data for multiple students. 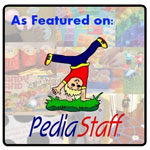 Articulation/auditory bombardment - Create a custom word list of articulation words. Record the words to be played via flash cards to be used for drill or auditory bombardment. Vocabulary - Create a custom word list of vocabulary to learn related to a student's curriculum and record definitions of the words as well. If they need to know how to spell the words in the classroom, they can practice spelling them too. Expressive Language - Have students create sentences using words on any of the lists. 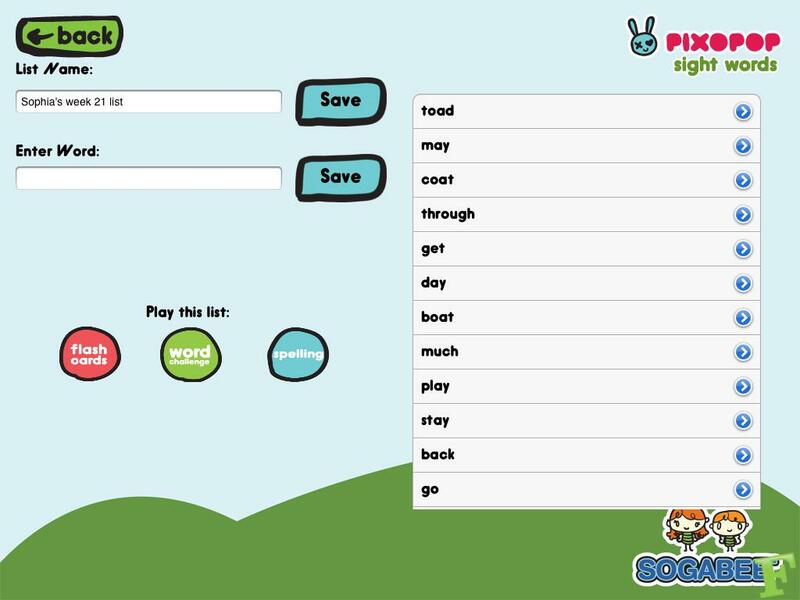 Sight Words & Spelling With Pixopop is available for the iPad for $2.99. 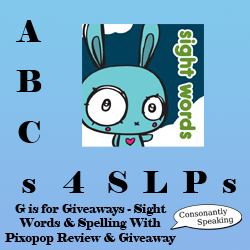 Consonantly Speaking was given an application code to giveaway with this review. No other form of compensation was received.